New Orleans has a cuisine that reflect the culture of the city and historical changes on the land. Here are 3 of them. Indulge yourself with these delicious bites when there. You are going to come across a wide variety of restaurants in New Orleans, specialized in the best examples from the world cuisine. However, if you are after a true New Orleans experience, you have to include the famous Po-Boy in your must eat list when you are there. Po-Boy, also known as po’boy, po boy, or poor boy is a sandwich. Between the New Orleans baguette lies roast beef or fried seafood. There are three different sizes that can be chosen accordingly with your hunger level: a quarter po'boy (20cm), half po'boy (41 cm) and full po'boy (81 cm). If you want your Po Boy to be “dressed”, then it is going to be served with lettuce, tomatoes, pickles and mayo. Of course, no matter what your choice of main ingredient is, you can always add and remove the dressings and veggies. So, where to eat the best Po Boy in New Orleans? Well, you have got more than a couple of options. Parkway Bakery & Tavern located on 538 Hagan Avenue is famous with the Fried Shrimp Po Boys. Killer PoBoys located on 811 Conti Street may be another great option. Katie's on 3701 Iberville Street and Guy's Po' Boys on 5259 Magazine St are also assertive when it comes to the most delicious Po Boys in the city. You can expect your breakfast to be a bit more “sugary” than usual when you are in New Orleans. 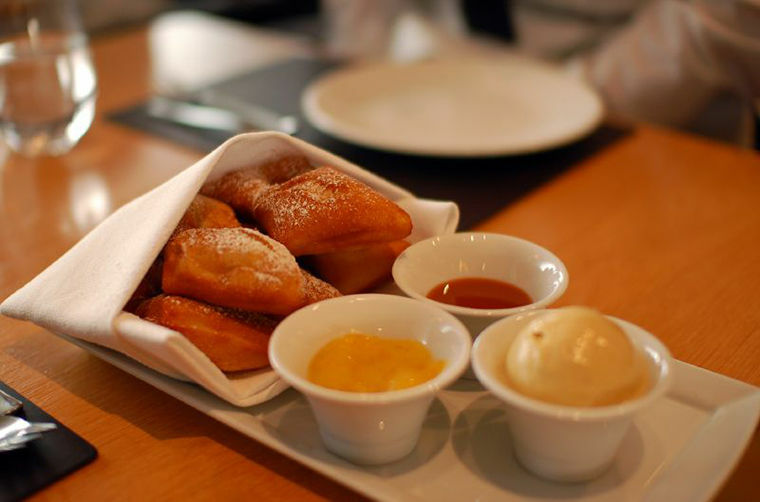 Beignets are the non-declared must have in a breakfast in the city and we know you will not regret it. Beignet is deep-fried choux pastry and usually fried right before serving in order to make sure they are hot and fresh in order to guarantee the maximum deliciousness. It is actually a part of Creole cuisine which constitutes the majority of the New Orleans local bites. The equivalent of Ladurée to Paris is Café du Monde in New Orleans. It is located on Decatur Street in the French Quarter and they simply serve the most delicious beignet you can taste. As you can imagine, not only because of its popular location but also because they serve simply the best beignet in town, they are more than crowded. So, choosing the time to visit wisely is recommended. If you want to know how sweet things will get in New Orleans, here comes your answer: Bananas Foster. Don’t ever think about leaving the city without trying this delicious local taste. Bananas Foster is made of bananas (hello, Captain Obvious!) mixed with vanilla ice cream. Okay, until here it may sound common however it is also the part when everything changes: the bananas are cooked with cinnamon, brown sugar and butter, after banana liquor and rum is added. It is common for Bananas Foster to be cooked right in front of you as a show in New Orleans since the cooking procedure includes the flambé. Commander's Palace located on 1403 Washington Avenue and Brennan's on 417 Royal Street are two good options if you want to try this delicious dessert.